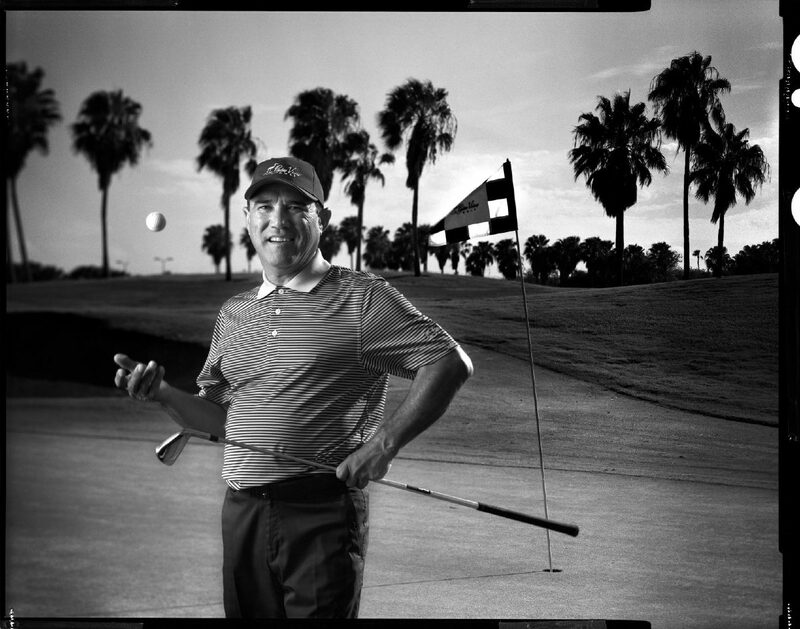 Carlos Espinosa spent 14 years playing tournaments around the world as a professional golfer. For nearly the past 20 years he has been the Director of Golf at Palm View Golf Course in McAllen, organizing tournaments such as the McAllen Amateur and teaching the next generation of golfer. McALLEN — Carlos Espinosa still clearly remembers the scene, playing alongside Tiger Woods in Hom Sin, Thailand. As Espinosa, of Reynosa, Mexico, said, “He was already Tiger by then,” and he was playing in Thailand, the land of his heritage, for the first time. The Thai Country Club hosted the tournament in February 1997. Tiger won in his 12th professional start. An amateur took second, and Espinosa tied for third. Moments like that remind Espinosa, a 1980 McAllen High graduate, of how his career ebbed and flowed with his confidence level, because golf is a uniquely mental sport. Espinosa had a 14-year professional career, the bulk of which was played on the Asian PGA Tour and the Mexican PGA Tour. He was born and raised in Reynosa — a town that did not have a golf course at the time — to Oscar, a urologist, and Yolanda. Carlos had an older brother, Marin, and a younger brother, Alejandro, and they both played golf, as well. Carlos didn’t compete in sports much as a kid, mainly just dabbling in tennis. But when he reached the McAllen High varsity golf team during his freshman year, he knew he was good. Carlos first met coach John A. Raders when Alejandro joined the Bulldogs’ golf team. Raders, who passed on Dec. 19, 2013 at the age of 76, spent 30 years with McAllen ISD, the last 25 as golf coach. According to an obituary in The Monitor, 15 of his former players went on to become professional golfers. His teams made runs to state and won 11 district titles. Raders convinced Espinosa to come to McHi for high school. Carlos only left the Valley once each year for golf, because money was tight in the Espinosa household. He didn’t really know what the northern cities’ golfers were capable of at the time. But Carlos’ naivety, combined with Raders’ undying belief in him, provided confidence in bigger tournaments, like when all three Espinosa brothers competed together at state. Espinosa went on to play golf for what was the best program in the country at the time, the University of Houston. He didn’t know how good the program was when he got there, but he quickly learned. He had to fight for every second of playing time. During his four years at Houston, the team won the national championship three times. The year they didn’t, they took second. Espinosa only participated in one title win because the team was so stacked. After he graduated, he exploded onto the pro scene. “My dad got emotional one time,” Espinosa recalled. At the time, Espinosa was still playing smaller tournaments in the Valley and southern U.S., trying to save up enough money for travel and entry fees. He played in a pro-am in Reynosa in 1986. He won the tournament, putting him into the pro stratosphere in Mexico for the first time. That was when he saw the pride in his fathers’ eyes. His confidence was sky high at the time, and even though he had failed to make it onto the main tour once or twice already, he was sure he would make it soon enough. Espinosa’s first win on the Asian PGA Tour came in his third year as a pro, 1988, in Taipei, Taiwan. “They had a lot of rain on the golf course that year, and it was not in good shape,” he recalled. Espinosa had a few top-five finishes that year, but in week 10 of the 13-week tour, he began feeling sluggish. He would later learn he was coming down with a serious illness that would take him out of action for a while. “I played great on the final day,” Espinosa said of the rain-filled Sunday. “I shot a 68, which under the conditions was more like a 64. His friend: You better not have that beer, you might be in a playoff. Espinosa: What do you mean? His friend: The last group is on the 18th tee, and you are only one shot back. The player in front of Espinosa hit a double bogey, and Espinosa won sitting in the clubhouse with an untouched beer in front of him. Things started to change in Espinosa’s life, and it only got better after he won the Mexico Open in his fifth year as a pro. He was on ESPN. He filmed commercials in Burbank, California. Espinosa flew from airports to sets in helicopters. When he turned in the giant bag of cash, the bank, which was connected to the hotel, set him up with the hotel’s owner, who gave Espinosa free rooms for a while. As his fame grew, more companies wanted to work with Espinosa. This led to one of the most movie-ready scenes in Espinosa’s life. A day before his first PGA Tour event, Espinosa went out to dinner with a representative from Titlist who was eager to make a deal with Espinosa. The following year, Espinosa came in second overall on the Asian tour. A few years later, he had an eye-opening moment. Espinosa said that moment laid the groundwork for deciding that golf would be part of his life rather than his sole focus. He built his first house, a beautiful home that still sits on the fourth tee box at Cimarron Country Club in Mission. He married in 1994, and he and his wife, Annette Marie Espinosa, had two daughters shortly after. Espinosa’s daughters, Karla Marie Espinosa and Andrea Elizabeth Espinosa, were the reason Carlos eventually left the pro game altogether in 1999. Espinosa knew he was done, and when someone mentioned a job was available at Palm View, he felt it was the perfect fit. Espinosa has been the golf director at Palm View Golf Course in McAllen for the last 19 years. “The moment I took this job, I knew I wanted to teach kids,” Espinosa said. With that sentiment in mind, Espinosa wanted to give local golfers the chance to compete and show off their talent. During his second year, he created the McAllen Amateur. The tournament helped grow Palm View’s reputation and ranks among the Valley’s most notable competitions. Espinosa accomplished things in his career that many golfers only dream of. He played in a U.S. Open. He played at St. Andrews, a course that has hosted the British Open multiple times. He still wears a Rolex he won at a tournament. His career went as his confidence did, and each year he didn’t make the PGA Tour chipped away at him. Espinosa said at a certain point he just stopped believing he could ever make the tour. He played in the U.S. Open in 1993 at Baltusrol Golf Club in Springfield, New Jersey. He had good practice rounds leading up to the event, but he could not maintain that confidence. Before the tournament, he was at the driving range and spotted legendary golfer Jack Nicklaus. Espinosa got in the tee box next to Nicklaus, just wanting to watch Nicklaus’ brilliance. About five minutes later, Tom Watson sauntered in and set up next to Espinosa. His love for the game told him this was a special moment, but another part of his brain was telling him something else. Espinosa never quite felt like he belonged. He missed the cut at Baltusrol in his only Major appearance. Espinosa’s vision for Valley golf will be on full display this weekend, as the 17th McAllen Amateur concludes today at Palm View Golf Course.